Over the past decade, annual rates of atmospheric CO2 increase have remained in a range of around 2.2 parts per million (ppm) each year. It’s a geologically blinding pace of increase driven by a human carbon emission on the order of around 11 billion tons each and every year. Primarily driven by fossil fuel burning, this massive dumping of carbon into the atmosphere is steadily filling up a number of the world’s key carbon stores. The oceans are brimming full with carbon — as we see in a rapidly rising rate of acidification. The oceans are warming, steadily losing their ability to keep a higher fraction of greenhouse gasses stored in solution. The trees are lagging in their ability to draw carbon from the atmosphere — a symptom of a combined deforestation, wildfire proliferation, and endemic outbreaks of invasive species that prey on key trees. And the carbon store in the Arctic is showing signs that it may be actively venting higher volumes of greenhouse gasses back into the atmosphere and oceans. As a leading indicator that some of these carbon stores are starting to fill up, or worse, dump a significant portion of their sequestered carbon back into the atmosphere, we would expect to see spiking levels of CO2 and CH4 in the global measures. Which is why when, starting on April 5 of 2015, Mauna Loa CO2 values shot up to around 404 to 405 parts per million in some of the hourly records, a few eyebrows were raised. 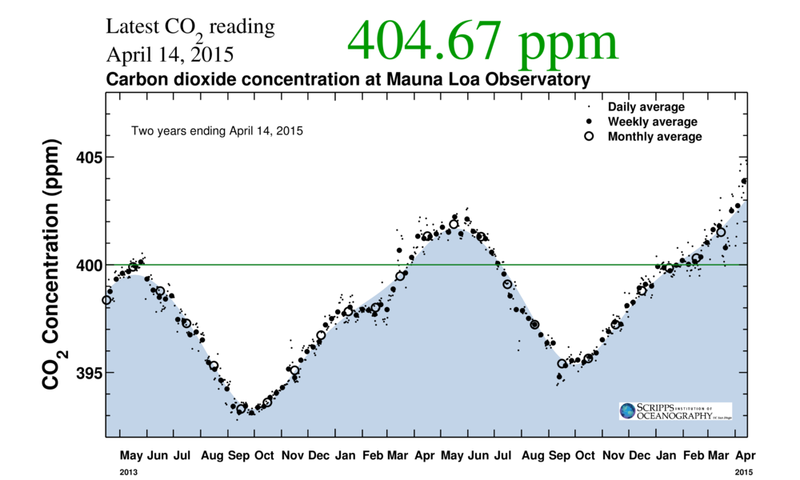 Typically, atmospheric CO2 peaks around mid-May. And, for this year, following the 2.2 ppm increase trajectory, we would expect a May monthly value of around 404 parts per million. So readings in the range of 404 to 405 parts per million in early April are a significant jump well ahead of the expected marks. If this increase remained consistent and showed continued seasonal rise on through mid-May, it could skew April and May readings upward — well beyond a 2.2 ppm annual increase at peak. Typically, the difference between April and May monthly values is in the range of 0.5 to 1 ppm CO2. So an April Average near 404 ppm could yield a May average of 404.5 to 405 ppm or a 2.7 to 3.2 ppm increase over 2014 peak values. A significant high departure that could be a leading indicator of a bad response from the global carbon stores. 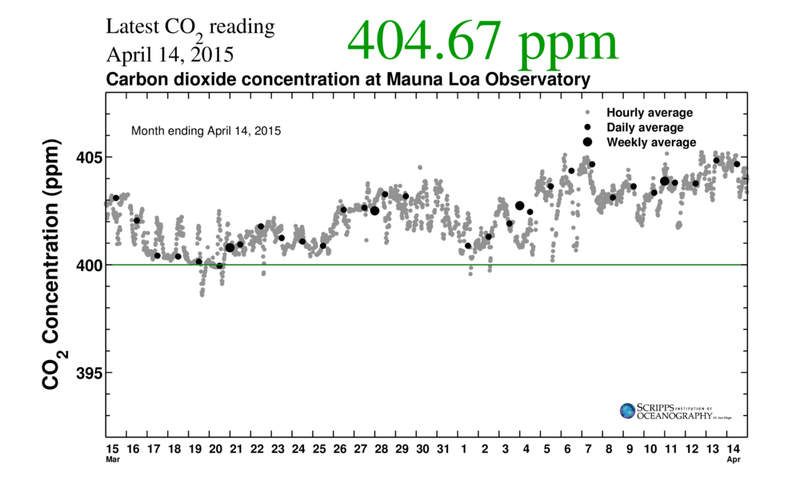 This possibility was raised as daily Mauna Loa CO2 values ranged from 403.2 ppm through 404.9 ppm from April 5 to 14 and as weekly values for April 8-14 hit 403.9 ppm. Of course, these admittedly worrisome spikes could well be noise in the overall carbon system. 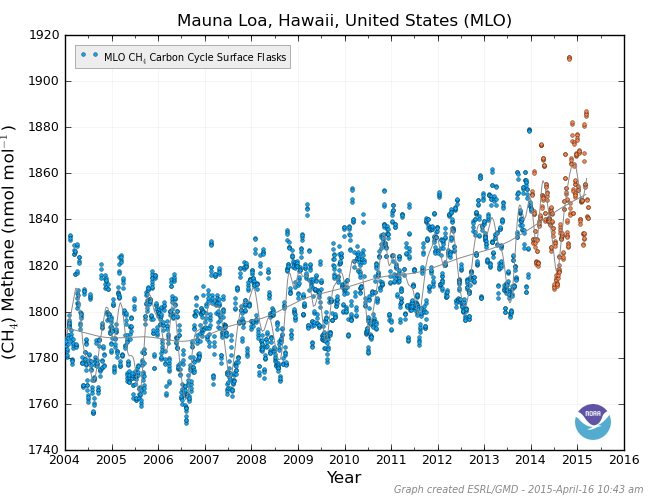 CO2 values have tended to vary more wildly in the Mauna Loa measure recently. And average rates of increase from peak to peak could still fall into the standard range. It is also worth noting that any major disruption in the global carbon system as it relates to CO2 would also show up as a trailing indicator in the CO2 airborne fraction measure. A higher level of emitted CO2 would remain in the atmosphere as sinks began to fail and as stores became sources. 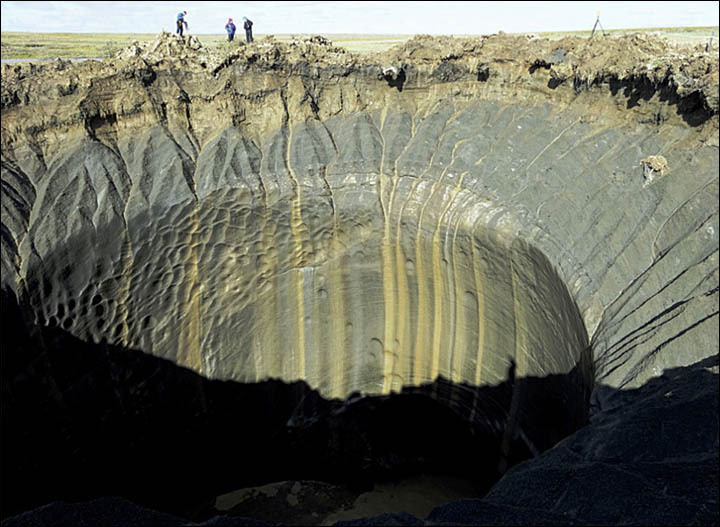 Such a carbon sink failure would eventually show up as a higher airborne CO2 fraction. Currently, the amount of carbon from CO2 remaining in the atmosphere is in the range of 45% of the human emission — or around 5 gigatons. If carbon sinks are retaining their ability to uptake CO2, then the fraction will remain relatively low. If carbon sinks are over-topping and bleeding substantial volumes of their carbon back into the atmosphere, then the airborne fraction measure will tend to rise as a trailing indicator. During recent decades, the airborne fraction has actually fallen as emissions ramped up — probably due to a combined increase in ocean surface exposure to CO2 and to an initial bump in the rate of CO2 respiratory uptake by photosynthetic life. But considering the very high volume of carbon being dumped into the global system coordinate with a wide variety of stresses to carbon stores resulting from both added heat and chemistry changes, these carbon sinks are under ever-increasing stress. A number of scientific studies have indicated a likely rise in CO2 airborne fraction, under business as usual fossil fuel emissions, to as much as 80 percent through 2100 — with start of carbon store failures during the current decade. 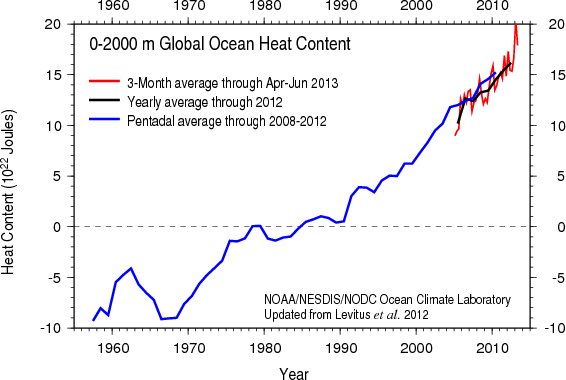 If carbon stores do begin to fail, we would first see atmospheric spikes in the global CO2 and CH4 measures. 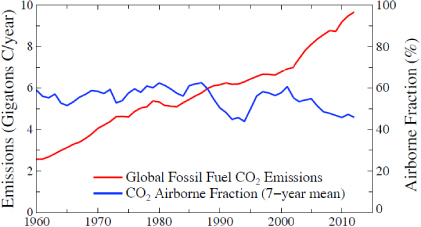 Then, as a trailing indicator, the CO2 airborne fraction measure would begin to ramp up. In this context, weekly CO2 spikes at Mauna Loa are some cause for concern, but we can’t make any strong calls of a larger carbon system response without a more consistent spike and, eventually, a jump in the airborne fraction.